According to the British Library website, during WWI (“The Great War”) propaganda was required “to mobilize hatred against the enemy, to convince the population of the justness of the cause, to enlist the active support and cooperation of neutral countries, and to strengthen the support of allies” (and of those within the homeland). The WWI propaganda employed related to knitting falls in the latter category and, like most effective propaganda, was intense and pervasive…and was ultimately successful. If not, then come along. They will soon use them all. Pick up your knitting whenever you’re sitting. A sock soon grows under your hand. Hark! I hear the bugle call. 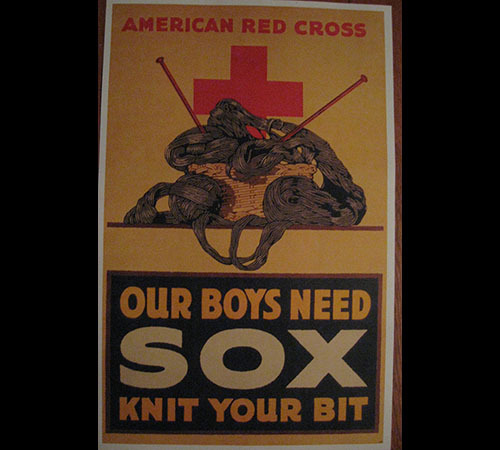 Once the U.S. declared war, the American Red Cross (ARC) and the Navy League formed an uneasy alliance to consolidate the efforts of other relief organizations, to encourage knitting production, to provide patterns/supplies, to gather finished products, to ensure quality of knitted products, and to distribute knitted items to those who most greatly needed them. To encourage large “armies of knitters” organizations published posters, fliers, and patterns; and sponsored activities such as knitting parties, knit-ins, and parades. Knitters frequently attended these functions in ARC uniforms. Journalists participated by printing ARC patterns in publications, by sponsoring knitting poetry contests, and by publishing press releases. News people particularly relished stories about unusual knitters: celebrities, men, the elderly, youngsters, and prolific knitters. 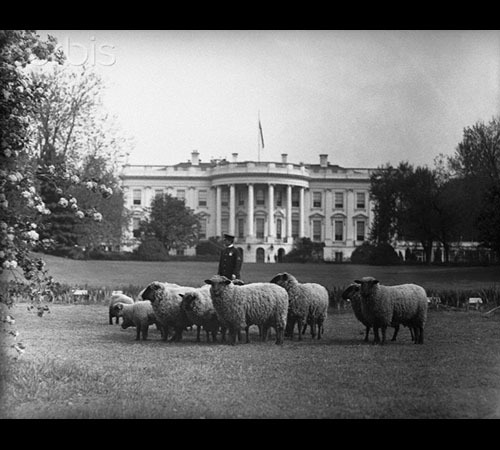 They even sponsored and/or advertised contests for the most prolific knitters: those who produced record-numbers of knitted “comforts.” Journalists also advertised the need for the production of wool, a “critical war material,” even publishing pictures of the small flock of sheep that were kept on the White House lawn to help provide wool (so small an amount that it was mostly symbolic). 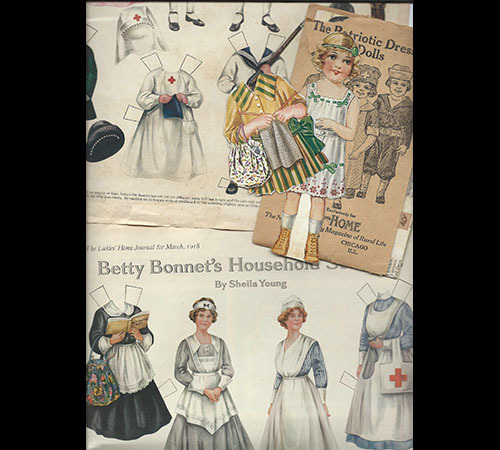 Yarn and needlework-pattern companies published booklets including or devoted to patterns for fighting men and war victims. Most of the patterns published this way were ARC-approved. Artists of all types became involved. 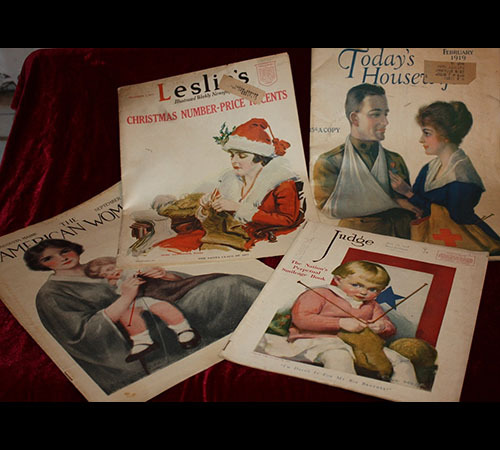 Graphic artists and cartoonists painted/drew of knitters for posters, postcards, magazine covers/illustrations, sheet music covers, and even paper dolls. Photographers captured knitters with their cameras. Poets wrote knitting poetry for poetry contests, for inclusion in magazines, for printing on knitting tool packaging, as well as for printing on knitting bags. 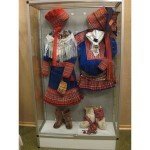 Lyricists wrote lyrics for numerous knitting songs and musicians wrote the music for the same songs. 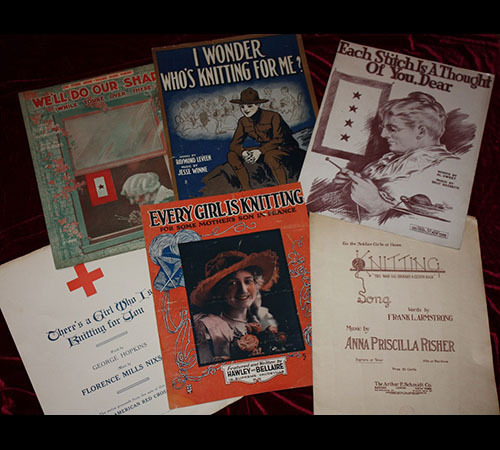 (See http://threadwinder.info/pubs/hist/sheetmusic/WWI.htm for information on many different English-language WWI sheet music publications depicting knitting or with lyrics about knitting.) Playwrights wrote plays to be presented at knitting bees and other venues. Novelists included knitting stories within their novels. 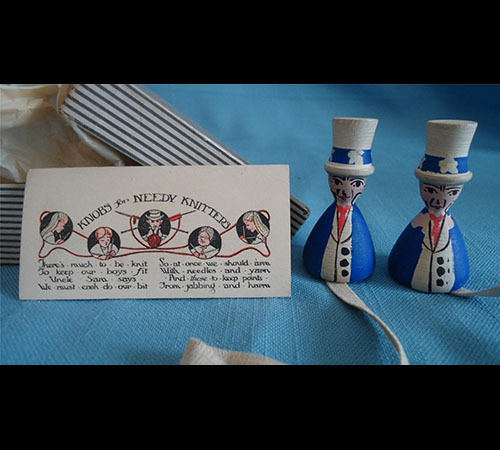 There were even hats and badges designed with knitting themes or relief society themes, so that knitters could proclaim their dedication during the rare times that they were not actually knitting. 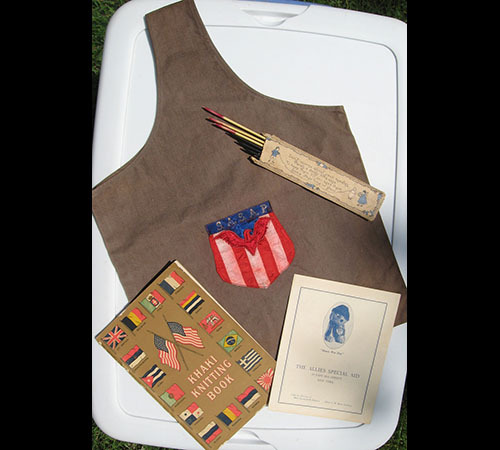 Retailers and relief organizations created patriotic knitting tools, often with sale proceeds going toward the charities, allowing people to further demonstrate their patriotism. These tools included patriotic knitting bags (with relief organization emblems, military unit emblems, service stars, or simply in red/white/blue colors), red/white/blue knitting needles, red/white/blue measures, gauges with relief organization emblems, and knitting knobs (point protectors) fashioned to look like Uncle Sam’s or ARC Nurses. The ARC even published a booklet: 100 Lies of the Hun, eleven of which countered negative knitting rumors, including rumors that the ARC was selling donated knitted items, that socks were being thrown away after being only slightly worn, and that many of the knitted products were shoddy or unwearable. All this propaganda was extremely effective. 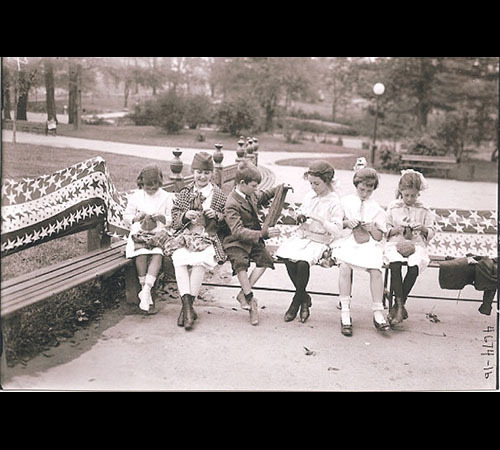 Knitting in public became not only acceptable, but expected, although occasionally chastised by some clergy and some entertainers for the distracting click of needles and for diverting full attention to their sermons/presentations. It was a patriotic obsession. So much so, that towards the end of the war, wool reserves were running low, however at that time the need for socks had grown critical. Clean, dry, hole-less socks were imperative to prevent trench-foot, frost-bite, and blisters. Knitters were told to discontinue knitting all other items and to devote all their spare time to knitting socks using any appropriately-colored wool they could muster. 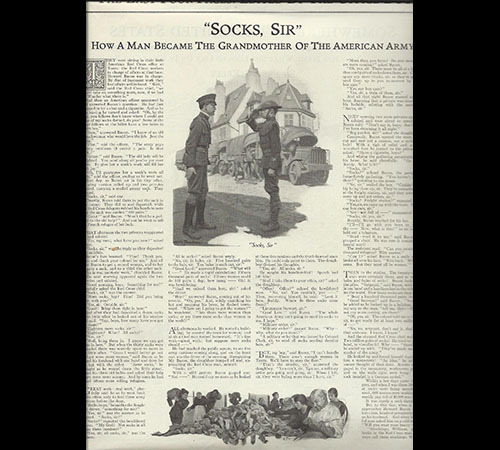 Magazines published articles about Italian women who had been employed to darn worn socks to help meet the need. 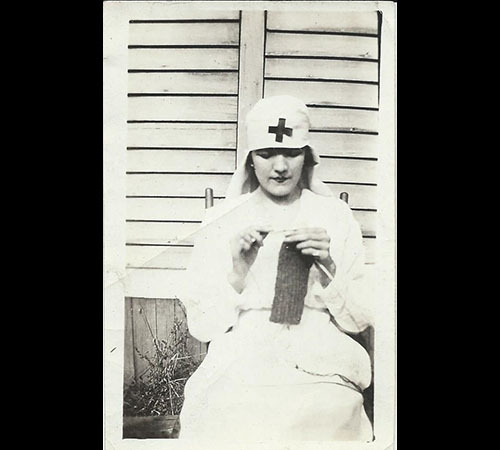 After the war knitting contributions were recognized as meeting a critical need. 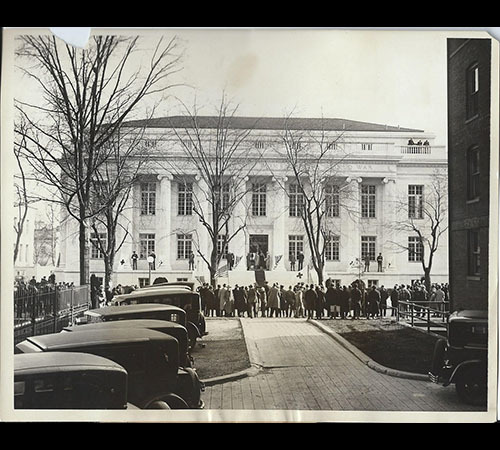 In 1930, then President Herbert Hoover dedicated the new second ARC Headquarters building (the ARC North Building) in Washington, D.C. to the women’s contributions to winning the Great War, enumerating the contributed knitted items of each type in the citation. 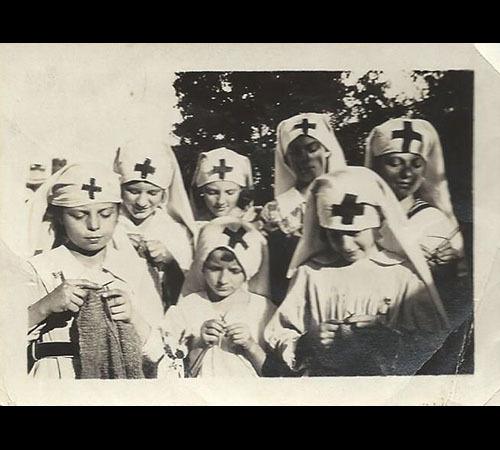 Participants in the knitting campaign have been quoted as feeling they did something to help the war effort, that they alleviated suffering, and that they were calmed by the act of knitting. There are many stories of thankful warriors and victims, sometimes writing thank you notes, a few of which made it back to the knitters. The knitting campaign, and the propaganda that fueled it, proved to be successful all around: for the warriors, the wounded, the displaced, and even the knitters themselves. The American Woman. (Augusta, ME: Vickery & Hill Publishing Co., Sept. 1918). Cover art by J. Knowles Hart. Judge (New York: Leslie-Judge Co, July 27, 1918). Cover art: “I’m Doing It For My Big Brother” by Guy Hoff. Leslie’s (New York: Frank Leslie’s Publishing House, 1917). Cover art: “The Santa Clause of 1917” by James Montgomery Flagg, Dec. 1 1917. Today’s Housewife (New York: The Geiger-Crist Company, 1919). February 1919 cover art by Guy Hoff. “Each Stitch is a Thought of You, Dear words.” Al. Sheet music: Billy Baskette, Leo Feist, NY 1918. “Every Girl is Knitting for Some Mother’s Son in France.”Featured & written by Hawley & Bellaire, Jeff Branen Publisher, New York, NY, 1917. 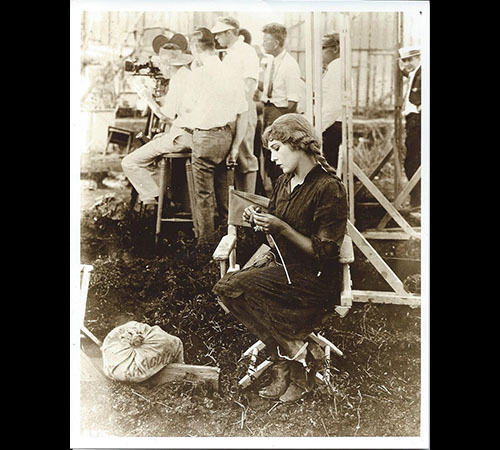 “I Wonder Who’s Knitting for Me.” Words: Raymond Leveen, Music: Jesse Winne, Winlee Music Company, 1917. “Knitting Song To the Soldier Girls at Home.” Words: Frank L. Armstrong, music: Anna Priscilla Risher, The Arthur P. Schmidt Co., Boston, Leipzig and New York, 1917. “There’s a Girl Who is Knitting for You.” Words: George Hopkins, music: Florence Mills Nixson, Florence Mills Nixson, Los Angeles, CA 1918. “We’ll Do Our Share While You’re Over There.” Words: Lew Brown & Al Harriman, music: Jack Egan, Broadway Music Corporation, New York, 1918. 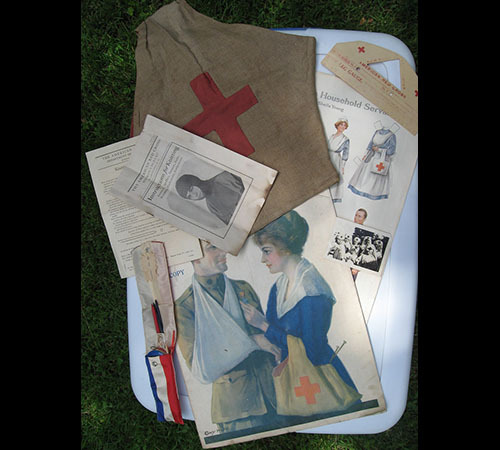 The photographs in the slideshow depict numerous vintage items from author’s own collection including photographs, magazines, posters, sheet music, knitting tools, and knitting bags.